What is the certification process to import to Hong Kong? 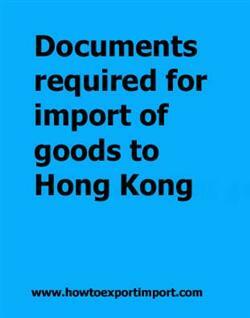 Types of documents required in Hong Kong to import goods? What are the documentation procedures as an importer in Hong Kong? Information provided here describes about documents required by each import in Hong Kong which need to be submitted with customs officials for the clearance process. The documentation may vary depending on the country of origin or destination. The documents required for import to Hong Kong to take delivery of import cargo is based on the product importing, multilateral, bilateral or unilateral trade agreements, and other trade policies of Hong Kong government. Thus, documents may have to be prepared in a particular way to comply with the requirements of the import or export country. The import documents required in Hong Kong also depends up on the nature of goods importing, regular trade policy of Hong Kong Government, specific goods importing to Hong Kong. This post explains about various documents at different levels that required by every importer need to be submitted with the Hong Kong Customs Authority in order to obtain clearance of the consignment and subsequently move it out of the port of Hong Kong Customs. Required documents to import in Hong kong port. Customs documentation requirements to import at Hong kong port. Import documentation in Hong kong port customs. What are the documents required to import in Hong kong. What are the import documents processes need to carried out with Hong kong customs. How to export from India to Cote d’Ivoire? How to export from Comoros? How to Import to Comoros? How to import goods to Hong Kong? How to get Certificate of Origin non preferential in Tamil Nadu? How to export from India to Bahrain?